Channel 5 is a British commercial television network. It was launched in 1997, and was the fifth and final national terrestrial analogue network in the United Kingdom after BBC One, ITV, BBC Two and Channel 4 (and sixth overall including Welsh-language channel S4C in Wales). It is generally the fifth-placed network in the country in audience share, and has been since its inception. Channel 5, like all of the public service broadcasters, broadcast a wide variety of programming. The channel mainly broadcasts entertainment programming, such as reality television, game shows and imported American drama. 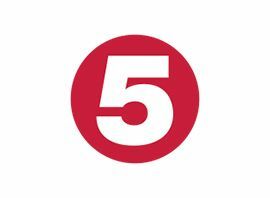 The channel broadcasts sports events not covered by other broadcasters and also broadcasts its own news service, 5 News. Channel 5 is a general entertainment channel that shows both internally commissioned programmes such as Fifth Gear, Big Brother UK, The Gadget Show, The Hotel Inspector and Gibraltar: Britain in the Sun and foreign programmes. The station has been very successful with imports from the United States in particular, including the CSI franchise, the NCIS franchise, Power Rangers, The Mentalist, Body of Proof, Once Upon a Time, Dallas and Under the Dome.